denomination "1 BAN", year 1993, letter M standing for Moldavian and monogram C. D. of Constantin Dumitrescu Moldavian coat of arms, oak branch and inscription REPUBLICA MOLDOVA meaning "REPUBLIC OF MOLDOVA"
The Republic of Moldova (former Soviet Socialist Moldavian Republic) became independent in 1991 and introduced own circulation currency in 1993. 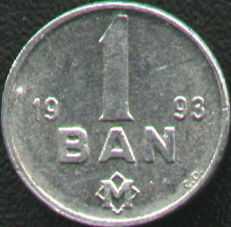 The currency denomination is LEU (plural LEI), a LEU being equal to 100 BANI (singular BAN), just as the Romanian currency. 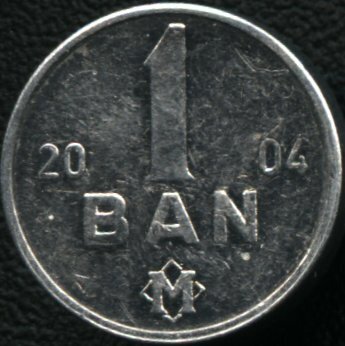 The formal name is LEU MOLDOVENESC (Moldavian leu) - as you will notice, an M lies near the obverse value expressed in LEI or BANI. This explains by the common history, language (even national colors) that the two states, Romania and the Republic of Moldova share. For a good period after independence, the national anthem was also common. 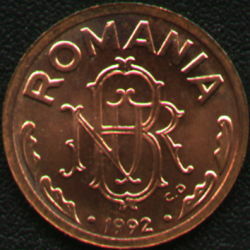 Moreover, the Moldavian coin series introduced in 1993 bears the initials C.D. standing for Constantin Dumitrescu, the person who engraved both the Romanian and the Republic of Moldova's coins of the time. 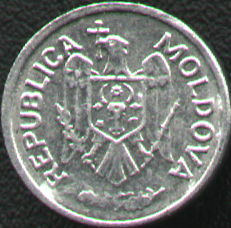 Since 2003 on the initials of the engraver were banned from the coins of the Republic of Moldova - a piece of 2004 being posted below as example. Please check the pictures below to acknowledge the striking similarity of the monograms of the two national banks.